* Special note for hunters: most hunting zones do not align with DEC's regional boundaries, so you won't find hunting seasons listed in the regional calendars. Use the statewide calendar instead. This calendar provides a listing of all DEC-sponsored events that are open to the public. You can click on any event in the calendar to view additional details about the event. 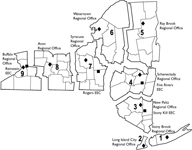 Note that the events at environmental education centers will only display in the region in which they are located, even though they serve residents from adjacent areas. We welcome people with disabilities to all of our programs. Please call the contact number ahead of time to let us know your specific needs and we will be happy to learn how we can best serve you. We would appreciate receiving feedback from our users. Please let us know if you encounter any difficulties viewing or using this calendar by sending an email to the DEC webmaster.